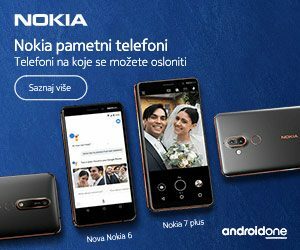 Već smo imali prilike pisati o savitljivim zaslonima i baterijama koje je Nokia demonstrirala ili patentirala posljednjih dvije godine. Sada je na vidjelo izašao novi patent koji je zaštićen elektronički uređaj uređaj sa savitljivim zaslonom preko cijele svoje dužine. Zaslon bi se savijao u jednom svojem dijelu pa bi se uređaj otvarao i zatvarao poput tablet računala što je potvrđeno shematskim prikazima iz patenta. U patentu se nadalje spominje kako se patent može pored računala primijeniti na tablete, phablete, smartfone, e-book readere ili media playere. An apparatus including: housing parts foldably connected to each other, the housing parts being configured to be movable between an open configuration and a closed configuration; a display assembly pivotably connected to the housing parts, wherein the display assembly comprises a flexible display part; the flexible display part is configured to bend in response to a closing movement of the housing parts; and the display assembly is configured to be retracted inside a space defined by the housing parts in response to a closing movement of the housing parts. Electronic devices such as mobile phones, tablets or other handheld or portable devices may comprise a foldable structure. There may be for example an open configuration and a closed configuration for different purposes. 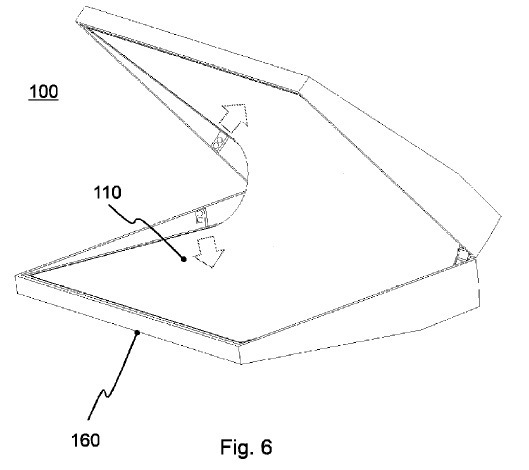 In an example embodiment there is provided a (hard shell) folding device suitable for accommodating a flexible or bendable display that extends over at least two movable housing parts of the device. In this way it is possible to provide a pocket size device with a relatively large display (for example a 6, 7 or 8 inch display or larger). For transport or storage the display is folded into a hard shell casing for maximal protection. FIG. 1 shows an exploded view of an apparatus 100 according to an example embodiment of the invention. The apparatus 100 is for example a tablet computer, a personal digital assistant, a smartphone, a media player, an e-book reader, a display or a flat-screen television. The apparatus 100 comprises a flexible display part 110, a metal spring 120 and frame parts 130. The flexible display is configured to be assembled on the spring 120 and the spring 120 is configured to be assembled on the frame parts 130. In an example embodiment the frame parts 130 comprise printed wiring board, PWB, and electronics (not shown for the sake of clarity). In an example embodiment the display part 110 is a touch sensitive display that comprises a touch sensor for detecting the touch of the user on or in proximity thereof. In an example embodiment, the touch sensor comprises a resistive, a surface acoustic wave, a capacitive–such as a surface capacitance, a projected capacitance, a mutual capacitance, or self-capacitance–an infrared, an optical, a dispersive signal and/or acoustic pulse recognition touch sensor or an array thereof. The display part 110 can be made of plastic, thin glass, thin metal or elastomer for example and, in a further example embodiment, the display part can comprise resilient materials, such as a gel, an elastomer, foam, rubber or silicone or other resilient structures such as hollow, woven, folded or coiled structures, or a folding membrane of e.g. thin polymer of fabric.